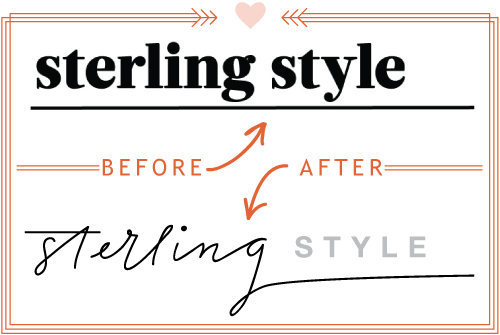 I'm sure you noticed Sterling Style's new look! I owe it all to the amazing Melissa! I'd been struggling to achieve a simple but sleek design for a while and Melissa knew exactly what to do. It was such an easy and enjoyable process with her. My favorite part is her calligraphy header. It's unique to her and gave me the look I was dreaming of. Right now Melissa and her husband are offering incredible deals on website branding. You can get a simple header for $70 (worth $100), Basic Package $275 (worth $500), Plus Package $375 (worth $700)! They are even promising to get your site branded before the new year. Head to her website to learn more about it. I love your new header! It's so unique but still simple and classic. I love the fresh new look. Perfect for the new year ahead. I love the new look! sometimes, changes are good! yes, I aboslutely noticed and I LOVE IT!!! simple and lovely! i love the font as well. I think it looks so simple and beautiful, Taylor... She did a fantastic job! Love the new look! So streamlined. Love the new look, it's simple and chic! I love it! I've been trying to work on my graphics and header. Thank you for the recommendation - their design looks good on your blog! Melissa's website wasn't working for me! Do you have another way of getting in touch with her? I love her work!